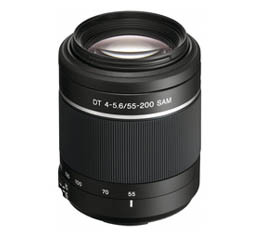 The DT 55-200mm F4.5-5.6 SAM (SAL552002) is a 3.6x telephoto zoom lens with an extremely versatile 55mm to 200mm focal length range (35mm-format camera equivalent: 82.5-300mm). It is designed exclusively for use with α digital SLRs incorporating an APS-C type image sensor. Weighing only 305g (approx. ), it offers high telephoto zoom power in a package that is light, compact, and easy to carry. And with a minimum focusing distance of 0.95m and a max. magnification ratio of 0.29, it can be used for macro shooting, too. Smooth AF operation is assured by a newly developed Smooth Autofocus Motor (SAM).